Nada has been a practicing physiotherapist for 5 years after having graduated from McMaster University with her MScPT in 2012. Prior to becoming a physiotherapist, she completed her Bachelor of Science degree also at McMaster. Her further training includes acupuncture training from McMaster University in 2015 and certification in Selective Functional Movement Assessment in 2017. Nada hopes to continue her education by adding skills in areas such as manual therapy and soft tissue techniques. 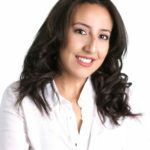 Nada choose the field of physiotherapy as she has always had a passion for sports science and rehabilitation. Nada believes physiotherapy treatment should be client-centred and individualised to meet each patient’s particular needs. She is committed to providing evidence-based patient care and her ultimate goal for physiotherapy treatment is to facilitate independence and function. She enjoys working with a variety of patients from those who are post-surgical (rotator cuff repairs and total knee replacements etc. ), post-fracture, and patients with a neurological focus (Parkinson’s disease, post-stroke Physio). Nada is excited to be working with the team at Oakville’s Palermo Physiotherapy and Wellness Centre.